Like me and many a foreigner interested in Turkish food, the beautiful and informative blog "Özlem's Turkish Table" has become an indispensable culinary encyclopedia of Turkish dishes and how to properly prepare them. Therefore, like many others I was thrilled to learn that Özlem Warren would be releasing her own cookbook this year and even more excited to hear that she will be in town in Bodrum this month for a number of cooking classes and culinary events. So, I tracked her down to find out more about her blog, new cookbook and upcoming cooking classes in Turkey and abroad. For years "Özlem's Turkish Table" has been the definitive blog for curious foreign foodies to learn about traditional Turkish food, and this year she has compiled a cookbook of the same name, which also includes recipes from her native Antakya. Hailing from this culinary heaven, Özlem had a corporate background in Istanbul before she and her British husband went to the United States for his MBA degree 15 years ago. While they now live in the U.K., they initially moved to Austin, Texas, where Özlem as a Turkish expat, first got the opportunity to teach her culture's food at the prestigious Central Market Cooking Schools in Texas. It was from that experience that she would begin publishing her recipes on the blog "Özlem's Turkish Table." A self-described home cook, although she has gone on to take a number of culinary classes and certificate programs in the U.S., Özlem tells me she has always been passionate about Turkish cooking and her culinary heritage. She also was instilled with the importance of sharing from an early age. She not only wanted to share the southern Turkish specialties from her roots, but she also noticed that not many recipes are written down with accurate measurements. "So with my blog, I wanted to share these authentic recipes in a way folks around the world can recreate easily," Özlem said. I asked Özlem if writing her blog on Turkish cuisine has changed her life to which she said: "It has changed my life immensely. Sharing is a big part of our culture; for us, it is our way of saying that we care," she said adding: "In Turkish we say 'Paylaştikca artan mutluluk', which means, 'Happiness that grows with sharing' and this sharing and connecting with food lovers around the world, seeing their appreciation, has given me such happiness. Sharing the recipes on my blog and teaching Turkish cookery enabled me to stay connected with my homeland and Turkish food lovers around the world." Özlem's blog has taken her all over the world sharing and teaching Turkish cuisine. In addition to teaching cooking workshops in the U.S. and the U.K., Özlem also teaches in Amman in Jordan, she hosts supper clubs, runs culinary tours to Turkey and even had the pleasure of being a part of the Turkish Chefs of the World (Dünyanin Türk Şefleri) TV show that aired on TRT as well as in 37 countries. Another career highlight has been participating in prestigious events such as the Taste of London, the London Book Fair and various food festivals to promote Turkish cuisine and culture.Özlem tells me one of the biggest highlights for her so far with her book has been being invited as a guest author at this year's International Edinburgh Book Festival where she was interviewed by cookbook author Ghillie Basan and got to talk about southern Turkish cuisine with over 100 people in attendance. The book "Özlem's Turkish Table," which is scheduled for general release in January of 2019, has sold 1,700 copies already. I asked Özlem how she came about preparing her own cookbook and she told me: "My cookery book has been a dream of mine for over 10 years. My blog, 'Özlem's Turkish Table,' acted as my 'online cookery book;' the more I published recipes, my reader base grew, hence the interest for a book. I also wanted my book to focus on Southern Turkish cooking, especially the cuisine of my hometown Antakya, as the cuisine is as diverse and cosmopolitan as the people that call this city their home." In her cookbook, Özlem showcases authentic dishes prepared at home, while highlighting influences from Levantine cuisine in family recipes passed down to her from her ancestors and adding personal stories to the recipes. "Turkish cuisine is also healthy, family friendly and most dishes are easy to prepare so I wanted to showcase these aspects too," she added. I asked Özlem if she thought Turkish food was gaining popularity abroad and she said that yes, there is a growing trend for healthy eating, cuisines with culinary heritage, which fits perfectly for Turkish cuisine. Vegan and vegetarian foods are also rising trends and Turkish cuisine provides a variety of options, which are always popular at my classes," Özlem said. From Nov. 7 to 10, Özlem will be teaching a series of cooking classes at the Central Market Cooking Schools in Houston, Austin, Dallas and San Antonio. This Sunday, Oct. 14, Özlem will be teaching a Hands On Masterclass at Divertiment Cookery School in London from noon to 3:30 p.m. Then, from November 7 to 10, Özlem will be doing a roadshow of Texas, teaching a series of cookery classes at the Central Market Cooking Schools in Houston, Austin, Dallas and San Antonio. But before that, Özlem will be coming to Bodrum for a number of wonderful events where she will share her expertise in Turkish cuisine. 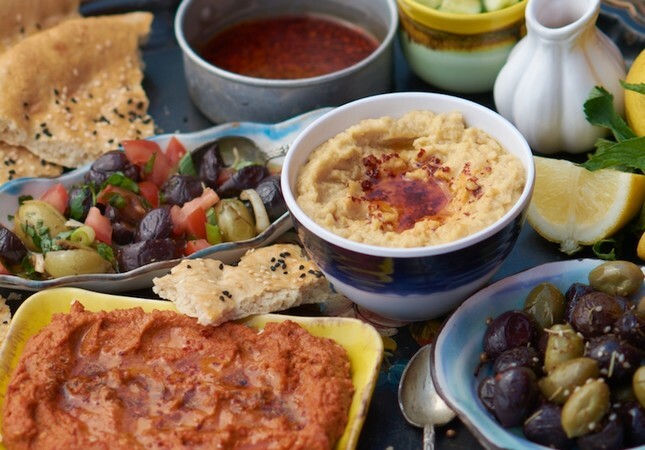 Her whirlwind Bodrum tour begins with a hands-on southern Turkish cookery class at the Foodrum Culinary Park, on Thursday, Oct. 25, from 10 a.m. to 1:30 p.m. Dishes on the menu include muhammara, mercimekli mualla, stuffed courgettes and Antakya-style pumpkin dessert. There is limited room for the course so if you want to attend, make sure to reserve a spot. Later in the day on Oct. 25 at 3 p.m., Özlem will be giving a talk on Turkish cuisine, with a focus on Southern Turkish cooking at the Herodotus Academy, H3A Bodrum, at the Oasis Conference Room in Bodrum. This is an event open to all Turkish food lovers, and she will also be signing copies of the book "Özlem's Turkish Table." Then, on Friday, Oct. 26 from 7 p.m. onward, Özlem will be holding an Antakya-style supper club at Karnas Vineyard.